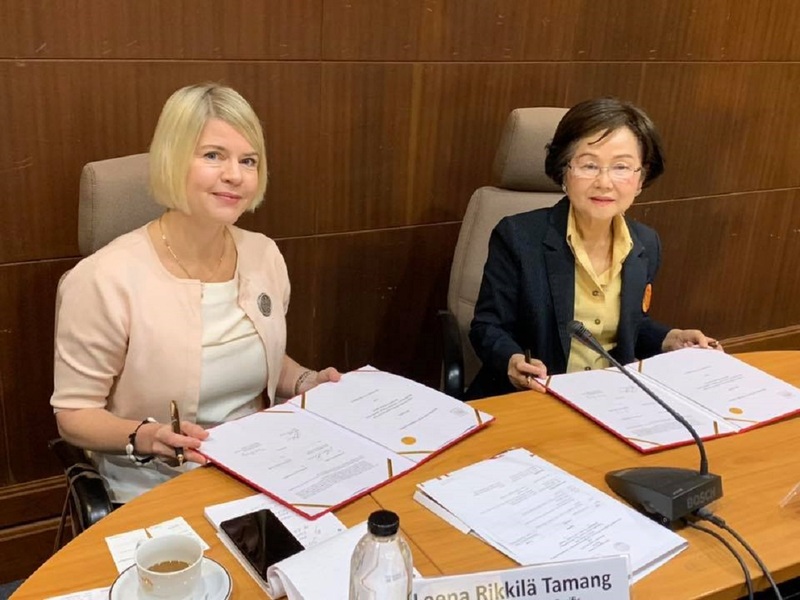 International IDEA and the Thammasat University sealed its partnership through a Memorandum of Understanding (MoU) in honour of the legacy and dedication to democracy building of the late Dr Surin Pitsuwan, former Chair of the Board of Advisers of International IDEA. The MoU creates the Surin Pitsuwan Fellowship, announced on 30 November 2018 in commemoration of the first anniversary of Dr Pitsuwan’s passing away. The Fellowship selected a student from Thammasat University through a competitive process who will spend three to six months at International IDEA's HQ in Stockholm, Sweden to contribute to the forthcoming State of Global Democracy (GSoD) Report of 2019 and its launches. The first selected Fellow is Mr Ractchanon Ghogar from Thailand. In addition, two undergraduate students/per year will also do internships for one or two months at one of the International IDEA’s offices. Rector Gasinee Witoonchart expressed her appreciation to International IDEA and its Secretary-General for establishment of this Fellowship in honor of Dr Surin Pitsuwan, and also for the envisaged joint research and academic collaboration. In her response, Leena Rikkilä-Tamang, Director for International IDEA Asia and the Pacific region recalled Surin Pitsuwan's contributions to the Institute’s work by opening doors to the ASEAN leaders, advising us on Thailand and by representing International IDEA at many global forums. In his remarks Dr S.Y Quraishi, Member of International IDEA Board of Advisers, and former Chief Election Commissioner of India, remembered Pitsuwan "as good friend and extremely skillfull Chair of International IDEA Board of Advisers. His passing was a true loss for the entire community working for democracy, but his legacy lives on, also with this Fellowship that International IDEA and its Secretary-General has established". With this MoU, signed on 27 March 2019 in Bangkok in the aftermath of general elections of 24 March 2019, both institutions also agreed to work together in developing and promoting comparative knowledge resources on democracy such as potential Thailand launch of the Global State of Democracy report, involvement in the ASEAN projects on study of political parties, and other research initiatives. Established on 27 June 1934, Thammasat University is a leading academic institution in Thailand, mandated to uphold excellence, service to society, promotion of arts and culture, social equality and social justice under the philosophies of constitution and democracy. At the MoU signing ceremony, International IDEA was represented by Dr S.Y. Quaraishi, Member of the Board of Advisers, Leena Rikkilä-Tamang, Regional Director, Asia and the Pacific Programme who signed on behalf of the Secretary-General of International IDEA, by Adhy Aman, Senior Programme Manager and Antonio Spinelli, Head of Nepal country office. Rector Gasinee Witoonchart signed on behalf Thammasat University. Nyla Prieto leads the citizen-led democracy assessment initiatives in the region, and serves as coordinator for the region’s publications and communication initiatives. Nyla has been in the development field for over 10 years. She has worked for several NGOs in the Philippines, with special interest in community building, governance and education. Prior to International IDEA, Nyla was with the ASEAN Foundation in Jakarta, Indonesia, a regional inter-governmental agency where she managed social development programmes in Southeast Asia.